Oh well done! I love knitting socks, so always glad to see a new sock knitter. Sounds as though the bug has bit if you’ve started another pair. Oh I love the socks! and they look nice and comfy too! Love the socks! You're much braver than I am. All I've ever tackled is the plain stockinette stitch variety of socks. :) You've done a beautiful job on them. Great socks! 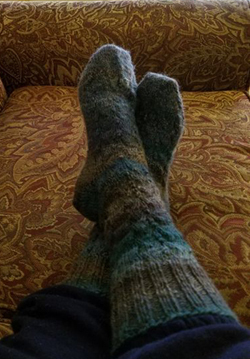 It's a goal of mine to learn sock knitting when I retire early next year. I purchase socks from my yoga teacher who also designs knitting patterns. They're gorgeous but not cheap! Both the socks and the modeling is so warm, cosy & relaxed ! That is a great gauge tool !!! !